The year that I went away to college was the year I first learned how to live with another person. The space you share in a dorm room is small, but it because evident pretty quickly that we were going to have to learn how to compromise. We would need to take turns cleaning, be respectful of study and bed times, and treat each other's space with care. Compromise is what all great relationships hinge on (well, that and communication), and it's never more evident than in "Jaipur Aviv," where compromise is pretty much the name of the episode. 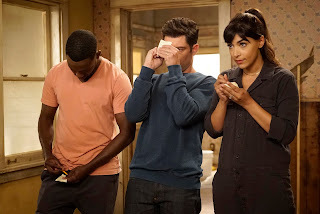 As Schmidt and Cece try to get their fixer-upper into a livable condition, Winston, Nick, and Jess realize that they'll need a fourth roommate to help cover the living costs in the loft. When Nick proposes that Reagan move in to fill the empty slot, Jess suddenly finds herself trying to negotiate — by order of loft legality — a unanimous vote needed for Nick to ask her to move in. Meanwhile, Schmidt and Cece learn the art of compromise as they try to decide on how to decorate and furnish their new home. This week's New Girl was a lot quieter in terms of comedy than usual. There were fewer zany shenanigans — no running down a road chased by a sorority of Trump supporters — but that doesn't mean the episode was less funny or important. "Jaipur Aviv" focused on what makes these characters funny, and it really reminded me that these people are actually friends. Nick and Winston have five secrets that they're keeping from Schmidt, complete with a handshake and a metaphorical vault that they keep the secrets locked in. In this episode, they try to determine whether or not they need to move a secret out and tell him the truth in order to lock a new one up. It's endearing and a silly little subplot, but it's also the kind of inside joke akin to what close friends and I have. We can say one word or phrase to each other, and the other person will finish the joke. Another example of this? The loft agreement and the fact that the group has meetings in order to cast ballots to make decisions. We've seen loft meetings come up quite frequently before ("The Captain") and we've also heard many references to the loft agreement (notably in "Parking Spot"), so it's always nice when the show chooses to remind us that these friends take their pacts very seriously, and have history with them. So while this week might not have been as raucous as usual, it was also really funny and ultimately sweet because it reminded us that these people not only care about one another, but really KNOW one another too. I can truly say that the New Girl writers are doing an incredible job so far in portraying Jess' feelings for Nick. Obviously when he suggests that Reagan move into the loft, Jess isn't too gung-ho about the idea but she masks it — in typical Jess fashion — and commits to getting everyone in the loft to vote for Nick to ask her to move in. At first, her only stumbling blocks are Schmidt and Winston (both of whom want Nick to do things for them before they'll agree to voting for Reagan to move in), but then the group votes for a third time and Cece is the stumbling block. It's understandable that she is hesitant for Reagan to move in — Jess is still in love with Nick after all. And if it's one thing we know for sure about Cece it's that she is fiercely protective of the people she loves. She doesn't want Jess to get hurt, but it's more than just that: she doesn't want Jess to put herself in a position where she will be hurt. As much as I assumed this episode was the stereotypical "Jess goes overboard to convince people she's fine when she's really not," that's only a component of why she decides to help Nick win a unanimous vote. She confesses to Cece that she cannot be there for Nick romantically, so she's throwing all of her support for him into their friendship. It's actually a really sweet, heartbreaking gesture because Nick has no idea and obviously if Reagan does move in, it'll hurt Jess to see them happy. But before Nick and Jess were ever romantically involved, they were friends. And that's the foundation that the show is resetting for them. Though it's admirable that Jess wants to recapture her friendship with Nick, we all know it'll ultimately be painful for her. And even if Cece can't convince her best friend to go back on her loft vote, she does ultimately choose to protect Jess another way: by adding an addendum to her "yay." Cece will vote that Nick can ask Cece to move in, only if the two agree to keep their PDA in the bedroom, not in the hallway or shared living spaces. It's this cute and sweet moment where Cece's friendship is on full display. But the most difficult person Jess has to convince to vote "yay"? Nick. When he's suddenly confronted with the reality that he could live with Reagan, he panics. And this is customary for what we know about Nick Miller: he becomes unsure of himself and bolts from difficult things and people. He's grown so much over the years in terms of emotional maturity, but that voice of dissent in the back of his head will always be there. Thankfully, Jess will also always be there. When he votes against asking Reagan to move in, Nick then confesses his fears to Jess. As always, Jess uses this opportunity to build Nick up and to remind him of who he is and what he's capable of. She gives him the confidence to vote "yay," and also lets him know that he will always have her unconditional support. It's a sweet, simple moment between the two, but I love those Nick/Jess moments — the ones where you realize how heartbreakingly perfect they are for one another because of how close they are and how much they've been through and how much they better each other. I think that what I loved most about this storyline wasn't that it featured Schmidt freaking out over interior design (though that was quite glorious), but that the moral of the story wasn't just "couples need to compromise." The moral of this story was actually that couples need to communicate honestly with one another in order to compromise. See, for the majority of the episode, Schmidt lies to Cece and tells her that he loves her ideas, when in reality, he hates them. That doesn't help their communication or relationship, but it makes Schmidt feel like he's helping Cece out (he's not). When they reach a breaking point, Cece calmly tells Schmidt that they need to find a middle ground and they can only do that if they're honest with one another. And compromise? It doesn't mean agreeing to something that Schmidt hates just to prevent an argument. I'm like Schmidt in that regard sometimes — I would rather lie about how I feel than risk the reality of confronting someone about my opinion. But when Schmidt and Cece sit down to try and actually compromise, they realize it is a lot more difficult than they initially assumed. Still, the episode ends with Schmidt and Cece realizing that sometimes there are just things you can't compromise on — sometimes one person's choice will win, and another's will lose. But as long as you're open and communicative, the option for compromise is always on the table. It's only when we shut up or shut down that we lose the ability to grow in our relationships. "Jaipur Aviv" was another fun episode of a solid New Girl season. I'm looking forward to watching the relationships on the show continue to evolve (especially the whole Reagan/Nick/Jess triangle the show has beautifully constructed so it doesn't even feel like a triangle), and know that the season will only get better and funnier from here. "Do we need a name?" "The Winners." "Winston and the Cuties!" The meta joke about how Winston realizes how uncharacteristically large the loft is? HILARIOUS. "If you think we're greeting people in our home TO LA CUCARACHA." "I love this. What is this, yellow?" THEY REMEMBERED THAT WINSTON IS COLORBLIND. THIS MAKES ME SO HAPPY. "Six words you never get to hear: Nick is calling a loft meeting." "She is a likable girl who is not Coach." I love so much that loft meetings and rituals are recurring themes in this show, especially mention of the loft agreement. Any episode where that gets dredged back up is a good one. And that the "no more than five damn people may live in this loft at any one time act." "Can a shark ruin a family vacation?" "No." "I mean... if it bites someone." "Maybe. Depends on the vacation." The fact that Jess got Schmidt and Cece loft roommate magnets with each of their faces is so hilariously in-character for her. The fact that Nick and Winston have a metaphorical "secret vault" in which they keep secrets from Schmidt is amazing. The fact that they have a handshake to accompany it is golden. THE FURGUSON-BISHOP WHITE IMMERSION PROGRAM. "You can support something without being the poster child for it." Jess looking at the magnets of her and Nick broke my heart. Do you think Nick will ask Reagan to move in? I feel sad for Jess...I constantly want to give her a hug.